It was a hard job to be on the expert nutrition panel that selected the top five recipes from the stack that were submitted to this year’s GridIron Chef Contest. All entries were judged on the contest criteria of nutritional value, taste and appeal, creativity, ease of preparation and tailgate friendliness. Want to try the winning recipes? Join us for the fourth annual GridIron Chef Contest and 5k Fun Run on November 19 at the Women’s Building OSU’s campus. The event is sponsored by the College of Public Health and Human Sciences and the Moore Family Center for Whole Grain Foods, Nutrition and Preventive Health and features a 5k run for the adults, 1k for children and a College Tailgate with food, drinks and adult beverages. The public will have the opportunity to select the people’s choice winner by voting for their favorite recipe. To prepare couscous: place uncooked couscous in medium bowl. Melt butter in 1 1/2 cups boiling water and pour over the couscous. Cover tightly and allow couscous to soak for 5 minutes. Fluff with a fork. In a small bowl, whisk together the yogurt, olive oil, vinegar, curry powder, turmeric powder, salt and pepper. 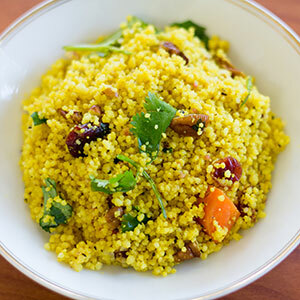 Pour over the fluffed couscous and mix well with a large fork. Add the remaining ingredients (carrot, cilantro, cranberries, nuts, red onion). Mix well and serve at room temperature. Fill a medium sized pot ¾ the way full with water and bring to boil. Skin and cut yams into medium dice chunks. Add yams to boiling pot of water (make sure all yams are covered in water) and let simmer until the chunks are fork tender (about 20-30 minutes). Remove yams from water and mash until mostly smooth. Put in the refrigerator to cool. Meanwhile, finely chop the kale. Mix all seasonings and spices, lemon juice, kale, and mashed yams together. Fold in the egg and add the ground chicken in pieces, mixing the whole mixture in between each meat addition until everything is combined. Roll about 1 tablespoon worth of the mixture into a ball. Repeat until all of the mixture is used up. Heat a sauté pan to low-medium heat. Add 1 tbsp. oil to the bottom and pan fry the meatballs (space meatballs about ½ inch apart in the pan) for about 15-20 minutes partially covered (or until fully cooked through). 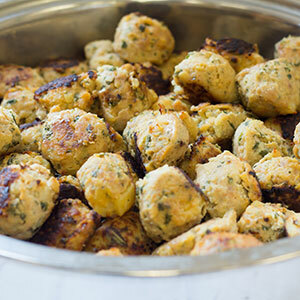 Rotate the meatballs every 2-4 minutes to evenly brown on all sides and ensure even cooking. NOTE: Cooked meatballs will be very moist and have a crumbly texture. To test for doneness, check with a thermometer (160 degrees F or higher). Repeat cooking process until all meatballs have been cooked. Enjoy immediately or cover and save for later. Stem the jalapenos and cut in half lengthwise. Pull out the seeds and inner ribs with your fingers or a small paring knife – this will reduce the spiciness of the jalapenos. Be sure to wear gloves if your skin is sensitive to handling hot peppers; also, avoid touching your face/eyes. In a medium-size bowl, thoroughly mix the grain, seasonings, and lime juice. Next, add the black beans, salsa, and ¼ cup of chopped cilantro. Stir well to combine, slightly mashing some of the black beans to create a cohesive stuffing suitable for packing into the peppers. With a tablespoon, fill the jalapeno halves with the grain-bean mixture using approximately 1 heaping tablespoon per half. 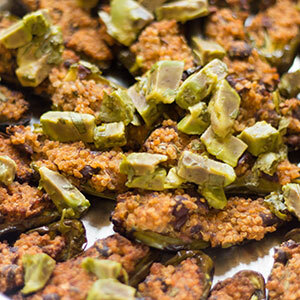 Place the filled pepper-halves, filling-side up, in a single layer on a large baking sheet. Coat peppers with the olive oil (or spray the outsides thoroughly with olive-oil cooking spray) and then drizzle with the hot sauce, if desired, to taste. Heat a grill to medium-high. Alternatively, preheat an oven to 400 degrees. Grill the peppers for 15 to 20 minutes, or until the peppers are soft, the outsides are slightly charred, and the filling is hot. 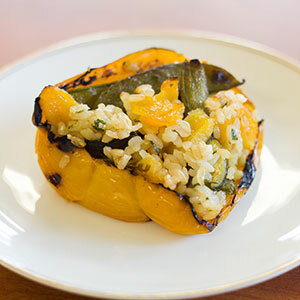 If roasting in the oven, check the peppers after about 10 minutes, and continue cooking until soft and heated-through (an additional 5 to 10 minutes, depending on the oven). Remove the peppers from the heat source and allow to cool slightly at room temperature. Sprinkle with chopped avocado, additional lime juice, and chopped cilantro, as desired. Rinse 1 cup dry rice and drain. In a medium saucepan, combine 1 cup rice with 2 cups water, 1/2 teaspoon salt, a pinch of ground cumin & turmeric, and 1 teaspoon flax seeds. Bring to a boil, cover and simmer for 35 to 40 minutes until all of the liquid is absorbed. Remove from the heat, and allow to sit for 10 minutes. (Note: you can make the rice in advance or simply use the leftovers of your favorite brown rice). Rehydrate your dried apricots. Place the apricots in a bowl and cover with boiling water. Allow to sit for 15-20 minutes until plump, then strain and thinly slice them. Heat 1 tablespoon oil in a large skillet over medium-high heat. Add yellow squash and green scallions, sauté for 3 minutes. Add sugar snap peas and sauté for an additional 2 minutes. Add cumin, pepper and salt to taste. Preheat broiler to high. Line a baking sheet with foil, and place peppers on their sides on the foil. Broil for 20 minutes, giving a quarter-turn every 5 minutes, until the peppers are medium-charred and soft. Allow peppers to cool for 15 minutes. In a large bowl, combine rice, apricots, vegetables and parsley. With a paring knife, remove the top (stem end) of each pepper and remove the seeds (do not discard any of juices inside). Preheat oven to 400 degrees and spray a large baking sheet with cooking spray. Once cooked, drain excess water. Add beans, avocado, chilies, cilantro and cumin. Stir until evenly mixed. Place 2-3 tablespoons of filling into each tortilla and sprinkle with about 1½ tablespoons of cheese. Roll tightly and place seam-side down onto prepared baking sheet. Repeat with remaining tortillas. Spray with a light coating of cooking spray and bake for 15-20 minutes until golden and crispy. While taquitos bake, prepare the sauce. In a medium bowl, mix together yogurt, salsa, cilantro and cumin until combined. Refrigerate until ready to use. 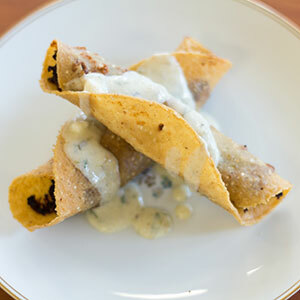 Once taquitos are baked, serve with dipping sauce and enjoy! Nutritional information for all recipes can be found here.